The National Philharmonic Orchestra of Trinidad and Tobago, established in 2014, is a group of professional musicians brought together under the auspices of the Ministry of Community Development, Culture and the Arts to perform local and international music at the highest level. 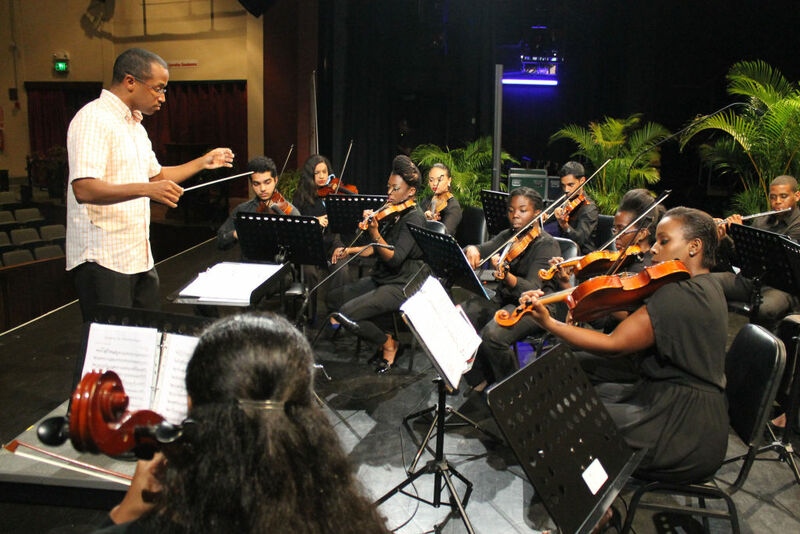 The Orchestra, the first of its kind in Trinidad and Tobago, represents the Ministry’s on-going thrust for the development of the creative sector in Trinidad and Tobago through fostering an appreciation and awareness of classical and symphonic music. The Orchestra performs under the baton of Music Director/Conductor Dr. Roger Henry. Dr. Henry’s career in music spans over twenty-five years during which he has worn many hats as conductor, composer and educator. He is currently an Assistant Professor of Music and head of the Fine Arts programme at the University of Trinidad and Tobago as well as Assistant Artistic Director of one of the country’s premier chorales. NPO’s Rellon Brown engaged in instrument demonstration at one of the Music Schools in the Community Outreach activities. The NPO’s performance credits include Informances in 2013 and 2014, full-length concerts at Seasons 1, Diamonds in the Sun: A Gift to the Nation, Classics in Tobago and a series of community outreach performances including the Western Division Police Youth Club and the Amarjyoth Sabha Mandir in Cunupia, Young Musicians Workshop in Tobago, St Dominic’s Home and St Jude’s Home for Girls in Belmont, Princess Elizabeth Centre and Finbar Ryan Geriatric Home.